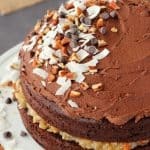 This vegan chocolate fudge cake is two layers of pure fudgy chocolatey deliciousness topped with an equally fudgy chocolatey frosting! 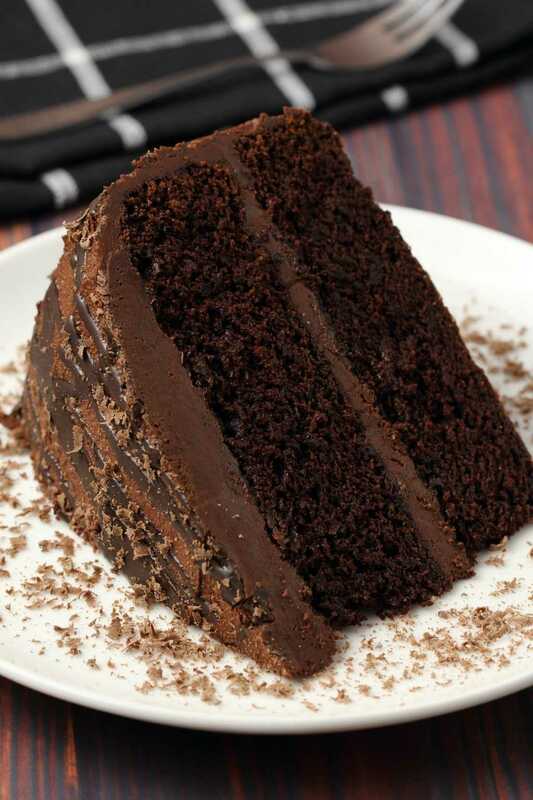 It’s like chocolate cake was over there feeling all smug like it’s the best dessert, and then chocolate fudge cake comes over and knocks regular chocolate cake right out of the competition! Well…. 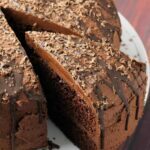 regular vegan chocolate cake is totally divine too, of course, but the difference between these desserts is the ‘fudge’ part. And how we create that fudge part is what makes this dessert the best darn thing you’ve ever tasted! 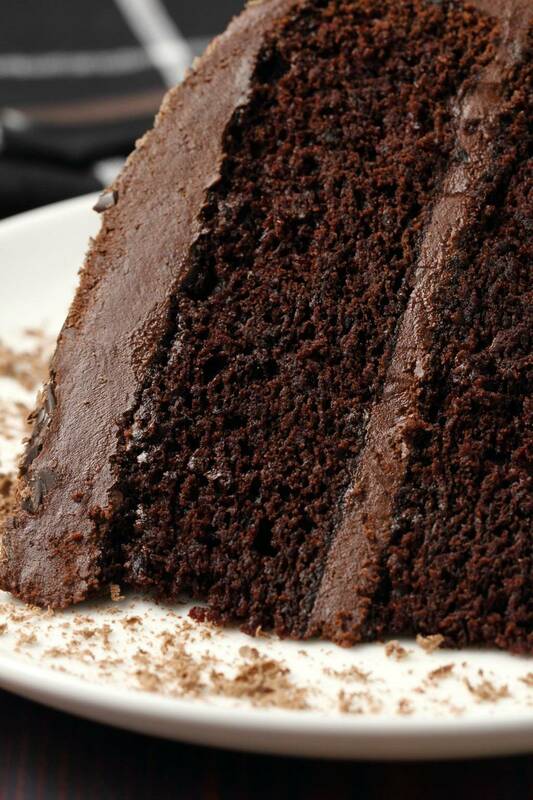 What’s the difference between a vegan chocolate cake and a vegan chocolate fudge cake? 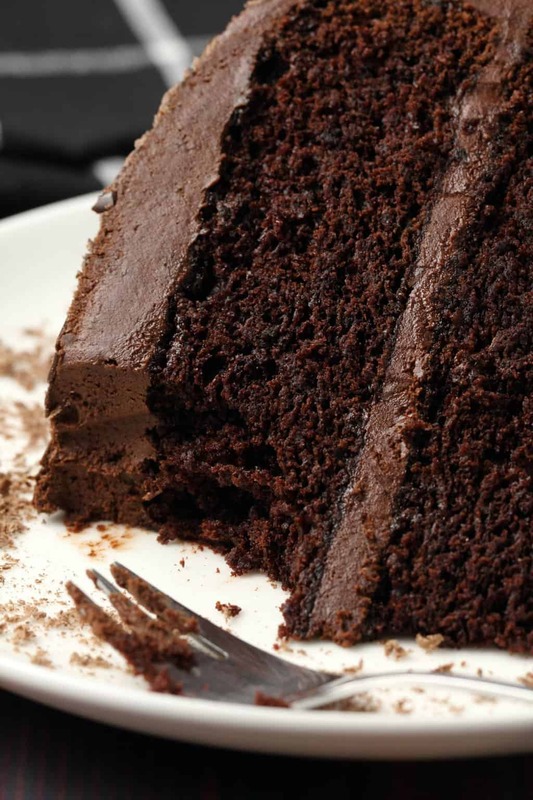 The ‘fudge’ part of a vegan chocolate fudge cake, is created by using vegan buttermilk instead of regular non-dairy milk and then adding in melted vegan chocolate to the batter before baking. It creates extreme richness of flavor and heaps of moisture! 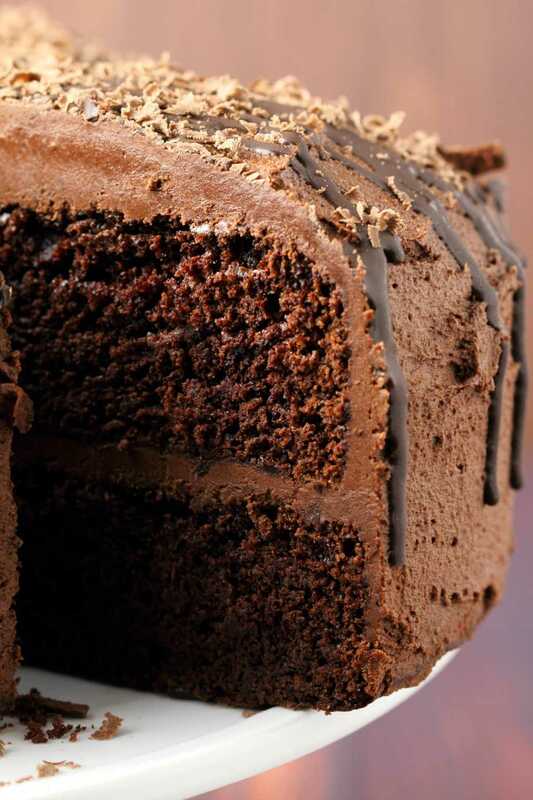 So it’s not ‘light and fluffy’ or ‘spongey’ the way a regular chocolate cake would be, nice as that is. This is a little bit more dense and ultra moist.We also use heaps of cocoa powder so that it is rich chocolate flavor to the extreme. It has all the fudginess you can dream of with mega chocolate flavor. And then we don’t stop there! The frosting also has melted chocolate poured into it and it is ultra thick and fudgy. 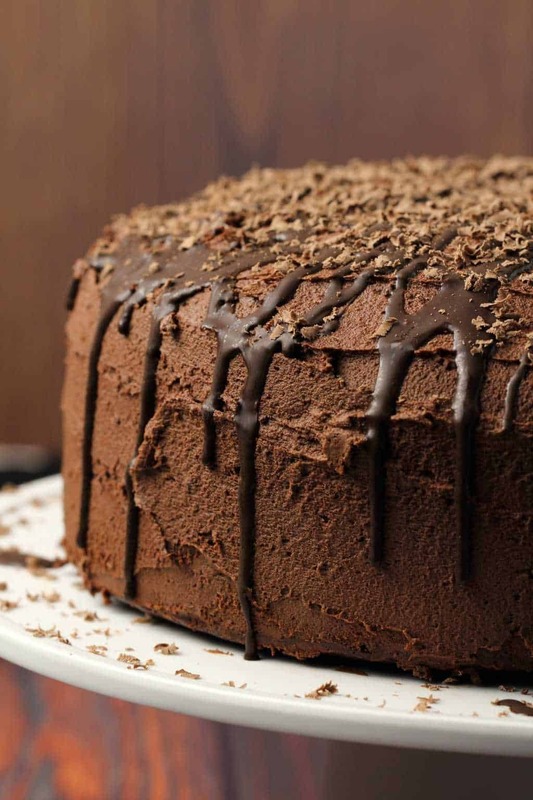 Decorate this cake with some more melted chocolate drizzled over the top and some chocolate shavings and you have a cake to remember. I used 9″ cake pans for this recipe so this is a very nice sized cake. I have been experimenting with different cake sizes and our classic vegan chocolate cake was done in 7″ pans, our vegan German chocolate cake and vegan chocolate zucchini cake were in 8″ pans and now here we are with this vegan chocolate fudge cake in 9″ pans! 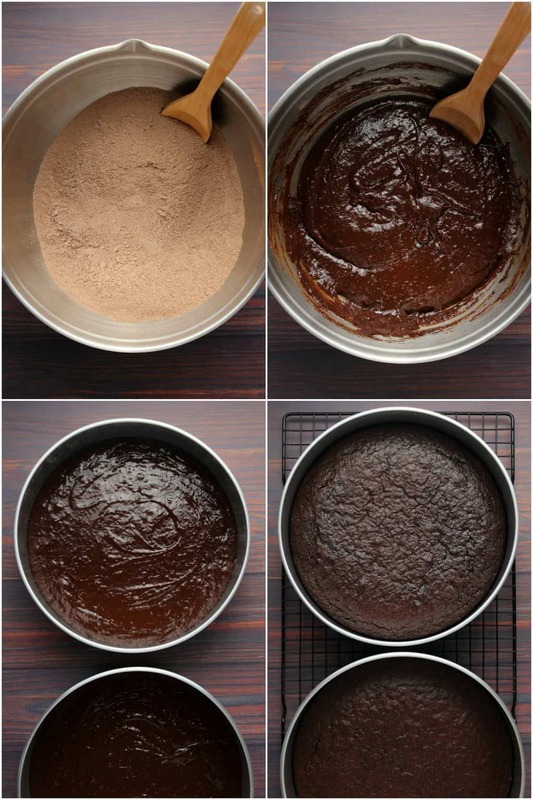 Update: Since this cake was posted we’ve done the best vegan chocolate cake which can be made in either 8″ or 9″ cake pans. So this is a large cake and it can feed a crowd! This was actually my first foray into 9″ cake pans and I must say I was a bit shocked that when you make cakes this size, your single layer wire cooling rack will NOT cut it. You need two of them! I had to go out and get an extra one. This cake is strictly one layer per cooling rack. 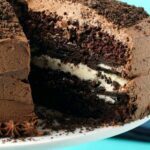 Topped with a chocolate fudge frosting! 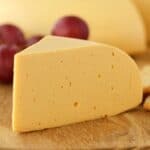 Keep it covered at room temperature and consume within a few days or stored in the fridge (covered) where it will keep for up to a week. 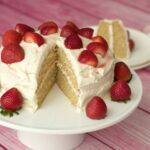 Want more delicious vegan cake recipes? 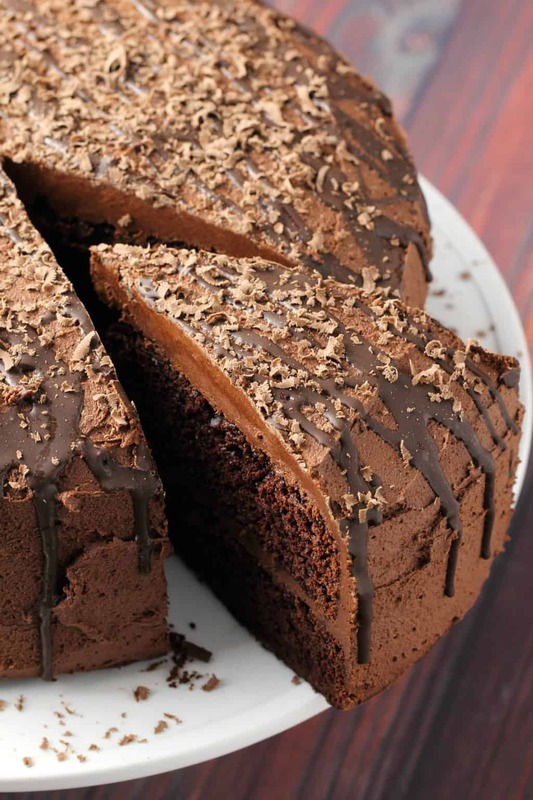 What do you think of this vegan chocolate fudge cake recipe? Let us know in the comments and please rate the recipe too, thanks! Sign up to our email list while you’re here, you’ll get an awesome (free!) recipe ebook containing 10 delicious vegan dinner recipes, and you’ll be the first to know when new recipes have been posted to the blog! 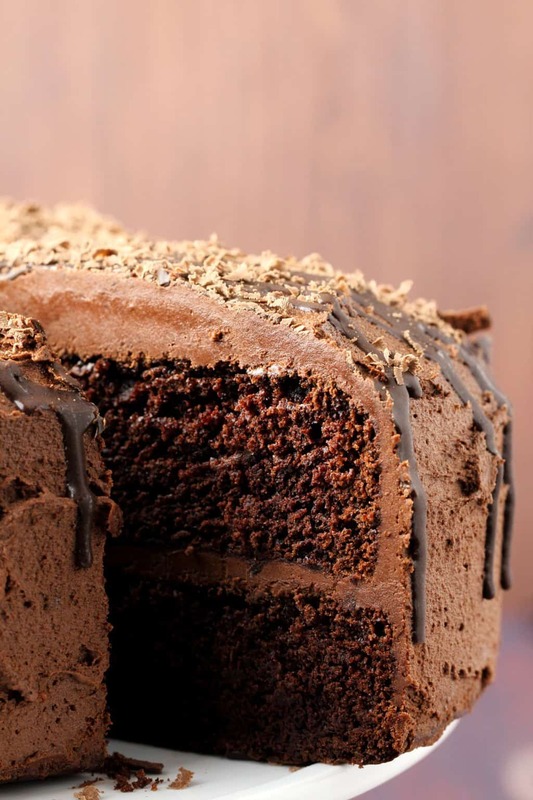 Fudgy and super chocolatey vegan chocolate fudge cake topped with chocolate fudge frosting. 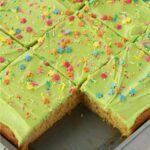 Ultra moist, 2-layers and every kind of delicious! Preheat the oven to 350°F (180°C) and spray two 9 inch cake pans with non-stick spray and line the bottoms with circles of parchment paper. Set aside. Sift the flour and cocoa powder into a mixing bowl. Add the sugar, baking soda and salt and mix together. Prepare the vegan buttermilk by adding 2 Tbsp lemon juice to a measuring jug and then adding soy milk up to the 2 cup (480ml) line. Leave it to curdle for a minute and then add to the mixing bowl. Add in the vanilla, oil and vinegar. 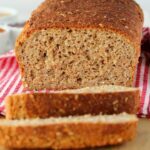 Prepare your flax eggs by adding 2 Tbsp ground flaxseed meal to a bowl and then adding 6 Tbsp hot water. Allow to sit for a minute to become gloopy. Add it to the mixing bowl. Mix everything until just combined. The batter will be quite thick. Lastly melt the vegan chocolate and fold it into the batter. Divide the batter evenly between the two prepared cake pans. Bake for 30 minutes or until a toothpick inserted into the center of one of the cakes comes out clean. 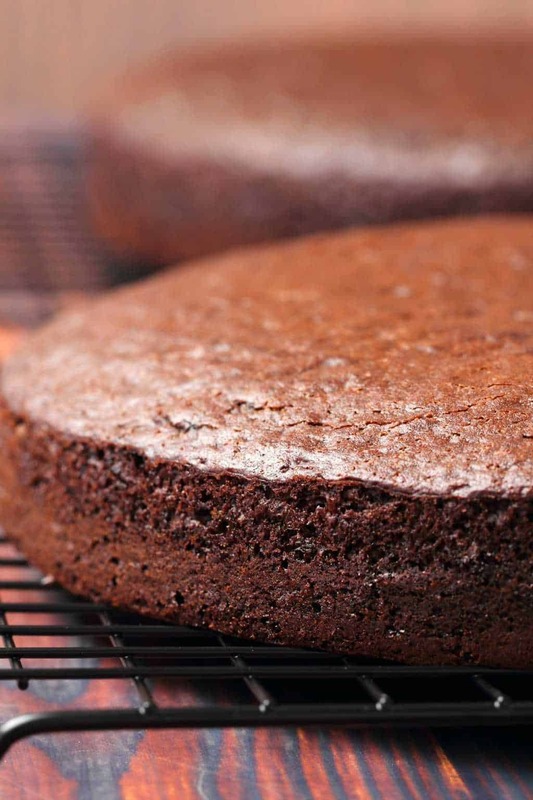 Transfer the cakes to a cooling rack to cool completely before frosting. 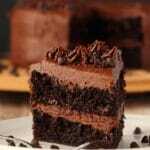 Lastly, melt the vegan chocolate and fold it into the frosting – do this part by hand, don’t use the electric mixer. 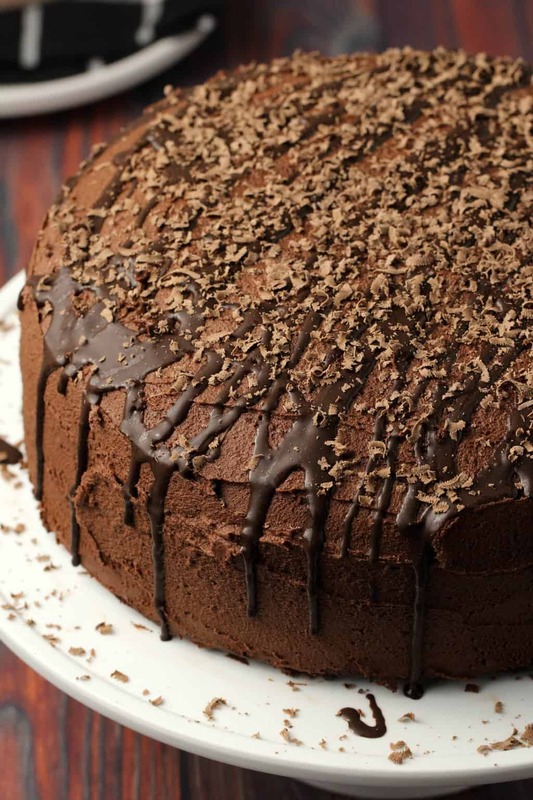 When the cakes are cooled, frost them and decorate with drizzles of melted chocolate and chocolate shavings. *Apple cider vinegar can be used instead of white vinegar. 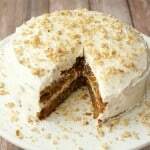 *Almond milk can be used instead of soy milk in the frosting and in the vegan buttermilk. However, soy milk works better for buttermilk as it’s thicker, so if you can use it, it’s a better option, but almond milk will also work in a pinch. 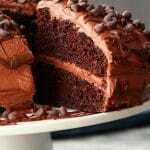 *Just a note that this makes a lot of frosting as it’s a fairly large cake. So if your mixing bowl isn’t very big (like mine) then hold a tea towel over the top when it starts mixing so that powdered sugar doesn’t come flying out the bowl. 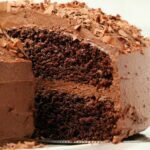 Vegan Chocolate Zucchini Cake – Fudgy and Moist! 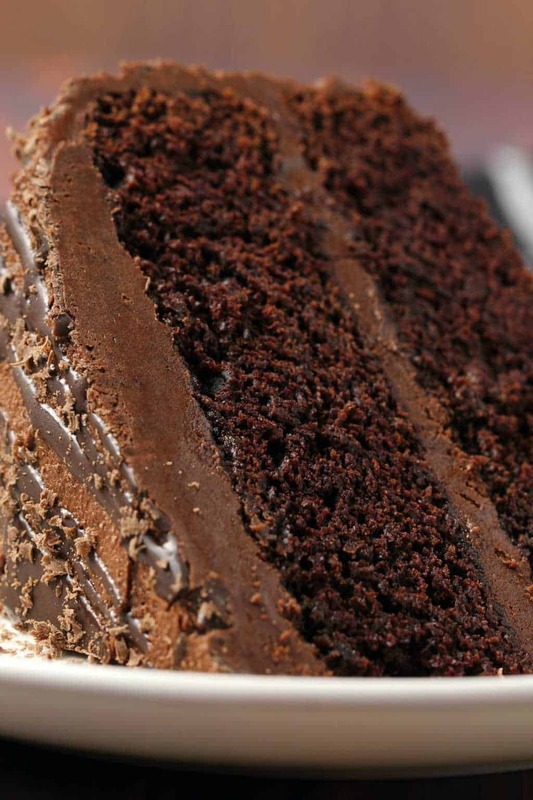 Rich, moist, chocolaty, delectable cake! Hi Alison..how about using palm sugar instead of sugar? Will it work?